Gold Peg leads the world with its complete 'best practice' processed cheese equipment and processing solution. Combine the high performance RotaTherm® continuous cooking system with a high-speed small particle grinder to put your processed cheese productivity ahead of the competition! Reducing to the small particle size of 2.8mm increases product surface area, which improves blending and cooking homogeneity. The RotaTherm® maximises hydration and cooking through process control for a fresher, cleaner, and more flavoursome product. Consistent quality processed cheese every day! In fact, Gold Peg’s continuous cooking systems are producing an astonishing 9 million kilograms of processed cheese per day around the world. Processed cheese is ideal in our consumer market as is has a much longer shelf life than natural cheese. Production costs are kept low through complete ingredients usage while additional ancillary equipment helps manufactures create an efficient line for their processed cheese needs. Gold Peg provides complete fully automated processed cheese lines designed for your production needs. 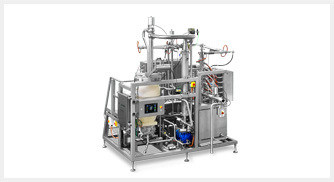 A turn-key Processed Cheese manufacturing line with full green 'GO' button automation takes you from blending raw ingredients to a cooked product ready for packing, filling, and distribution!